He's the Super Saiyan God Super Saiyan of my dreams. The Dragon Ball Z: Extreme Butoden demo hit the Nintendo 3DS eShop last week, and it has us dying for more fighting action already. The demo was unfortunately short and sweet, with only four fighters available for combat. However, with a newly released code, you can add one more fighter to your roster. 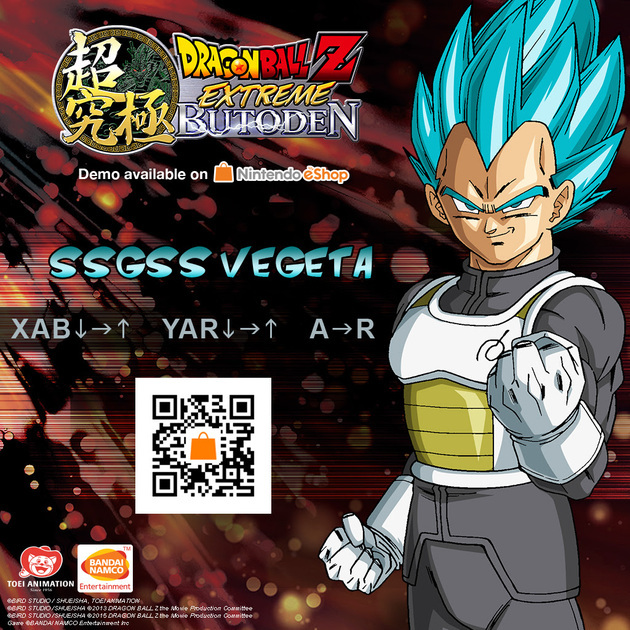 Super Saiyan God Super Saiyan Vegeta can be unlocked with a code at the title screen of the Dragon Ball Z: Extreme Butoden demo with the button combination shown in the picture above. You can then pit him against the already available fighters: Goku, Young Gohan, Fat Buu, and Vegeta. The demo is limited to 30-launches so hopefully you haven't been too overzealous with it. If you have, don't fret, you can get the whole game on October 20.